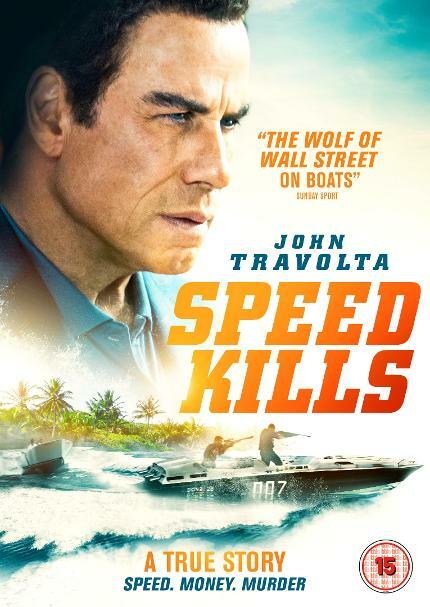 Based on a true story of one of Miami’s most notorious businessman Ben Aronoff (John Travolta), Speed Kills begins in the Miami car park of his Aronoff’s speed boat business. After being threatened by a stranger (Tom Sizemore) a car pulls up and the driver points a gun at Aronoff. We then jump back 25 years to 1962 New Jersey where Aronoff is in a call box explaining that mob boss, Meyer Lanskey (James Remar), has threatened his construction business and he needs to get out of town. His quick escape from New Jersey takes him to Miami where falls in love with speed boats, we know this because Travolta tells us this in one of his many voiceovers. Aronoff subsequently takes up speed boat racing, a sport that he’s so successful at he becomes the world speed boat racing champion. Aronoff then sets up a boat building business which becomes so successful it attracts the attention of Lansky. Lansky then heads down to Miami where he reminds Aronoff of how he managed to become a success. Aronoff is then forced to run his business as a front for Lansky’s global drug empire. The story sounds so simple but you would never know it by watching Speed Kills as it’s hard to work out at times what Aronoff is actually doing for the mob. We do see him moving drugs for them but the financial side, which was Aronoff’s biggest involvement, is all a bit of a haze. Travolta is as watchable as ever, if you’re a fan that’s good, if not you should probably give this a miss. The racing scenes are for the most part well done although it’s pretty obvious in the long shots that it’s not Travolta in the boat, the doubles hair style, much like Travolta’s in the movie keeps changing (maybe it was a wig, oh it was, couldn’t tell at all). Speed Kills is never going to win any awards but it does make for an enjoyable, if not more slightly confusing movie than it has to be.